apologies for the lack of recent posts, but i spend the better portion of last week up in Boston for work. that’s where I was born + raised, + most of my family still lives there, so I also got to spend some always-welcome quality time with my parents while I was in town. It was a fantastic trip! while i love traveling, there’s something wonderful about coming home. after a bunch of days of eating delicious-yet-decadent restaurant food, i love getting back into the kitchen, cooking up healthy homemade meals + baking homey, comforting treats. this time, i didn’t want to run out for ingredients, so i had to get creative, baking something that utilized ingredients already in the house. i had both oats + chocolate chips on hand, stumbled across this recipe + knew i had to try it! in small bowl, combine the ingredients for the oat topping: 1/4 cup of rolled oats, 1 tablespoon of white sugar + a pinch of cinnamon. set aside. add the remaining 1 cup of oats to a bowl + add 1/2 cup of milk. let soak for 5-10 minutes, while you prepare the first few steps of the muffins. in a large bowl (or the bowl of a stand mixer fitted with the whisk attachment), combine egg + brown sugar + whisk until smooth + caramel in color. add in vanilla + applesauce, whisking well. add flour, oat/milk mixture, baking soda, salt + cinnamon + mix. add remaining milk + combine until smooth. fold in chocolate chips. line a muffin tin with liners (or spray with non-stick spray) + pour about 1/4 cup batter into each liner. sprinkle the tops with the oats/sugar topping. bake for 15-18 minutes, or until a toothpick inserted into the middle comes out clean. 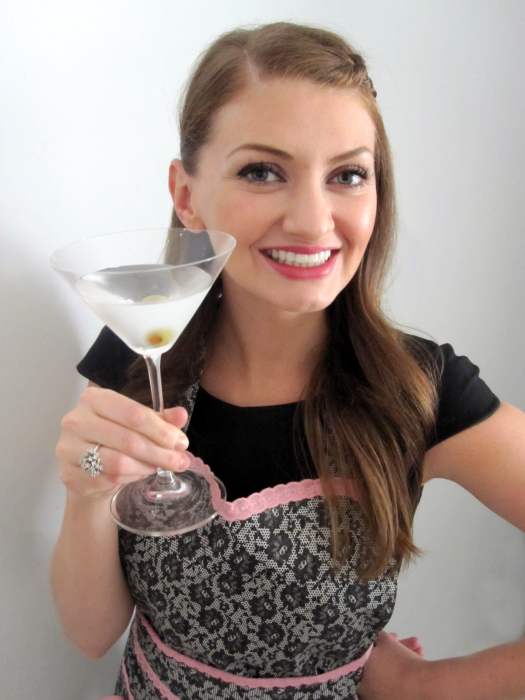 i remember seeing this recipe before, and love that you healthified it. all the chocolate chips make the muffins look so decadent… a perfect transition from restaurant cooking to home cooking! i might have been a little heavy-handed with the chocolate chips. =) i couldn’t resist! They look like the perfect snack! Yummmm! I love the idea of muffins for breakfast…but often I feel so guilty acting on that dream. 😉 These look like treats I could totally justify early in the morning. So glad you had a great trip and got to spend some time with family! These muffins look wonderful–I LOVE all of the chocolate chips popping out of ’em! YUM. i love these amy. i’m down for anything that resembles oatmeal cookies. Yum! I think the family would love these. I wonder if I could slip in some whole wheat flour, maybe 1/2, just to step up the healthiness a notch… This is great, thanks! hey kelly! the original recipe actually offered a substitution for whole wheat pastry flour, so you could definitely do that! =) i would’ve done that, too, but i was lazy about not wanting to go to the store + didn’t have any on hand. I didn’t know you were in the area! And I absolutely need a muffin in my life. I’m happy your trip went well and you got that nap. These look super yummy but I’m wondering how they’d be with raisins. I’ve never put raisins in a muffin but I like the thought of an oatmeal raisin cookie muffin. I’ll let you know if I try it out! And I agree, it’s so nice to come home after a trip and make something to eat. Normally trips equal ham and cheese baguettes for every meal. Blaaaa. erin, i think you could definitely substitute raisins (or even current, dried cranberries, etc.) in lieu of the chocolate chips. i like oatmeal raisin cookies, too, so i’ll be excited to hear how they turn out! Glad you had a good time in Boston – I bet it’s nice and cool up there at this time of year. (compared to our sweltering locals at least). I will be making these very soon! I have almost depleted my muffin supply in the freezer, and this looks amazing! Hi Amy! These muffins look SO good. ANd not a drop of oil or butter – can’t beat that! You had my attention (& bookmark) with the oat topping. Holy yum! Also really love that you used applesauce (with cinnamon & sugar) and only 1 cup chocolate chips. And your muffins look filled with chocolate! They look amazing Amy! Oh wow, look at all the chocolate in those muffins. That’s my kind of breakfast! I didn’t know you were originally from Boston, I live in RI! I’m sorry. did you say you might have been heavy-handed with the choco chips? Is that even possible? I’ve always love oatmeal chocolate chip cookies and I’m in awe at them in a muffin form. This would make a perfect breakfast for me… it has the sweetness I crave in the morning AND it’s healthy. It’s a win-win! Oh I love muffins for breakfast and these look so good! Love the oodles of chocolate chips you added. 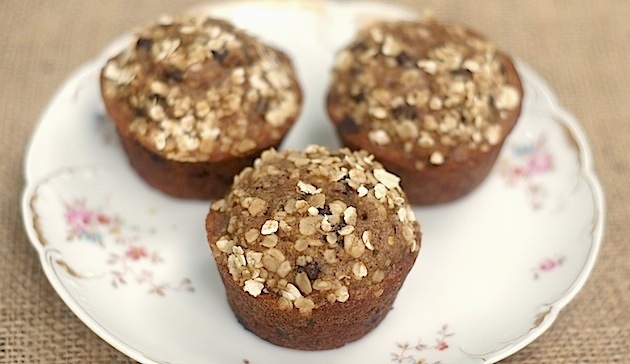 These are some great looking muffins, I love that the oats add some real heartiness. I love anything made with oats….and chocolate! Looks like yummy breakfast or snacking. Well any thing with chocolate chips is bound to be delicious!! I love traveling and coming home and relaxing to baking and tv reruns – sounds like Boston was pretty lovely. I love Boston! But home always does have an exceptional comfort to it. These muffins look bonkers good! And like the perfect thing to nestle back into home life with. so glad you had a good trip–Boston is one of my favorite cities! i will be making these very soon! i struggle with quick, healthy breakfast foods that my kiddos will eat. if i give them a muffin with chocolate in it, i’m thinking they’ll be very happy campers. These look absolutely awesome Amy!! My kind of muffin! Home cooked meals always taste better after being away and eating out in restaurants for too long. These muffins look fantastic! They really look delicious! Well, and somehow they look healthy, too! Did you see all those chocolate chips?!? Holy yummy! That looks so tasty! Coconut water, not coconut milk? Interesting! yup! i didn’t have any milk (cow, coconut or otherwise) in the house, but i did have coconut water (this kind), so that’s what i used + it turned out great! Glad you had a nice time in Boston, Amy! This recipe looks like another winner, and I love the thought of having them on hand for healthy snacks as well as breakfasts. Bet they don’t last two days around here with my guys. perfect little snacks or breakfast item! can’t go wrong with choco chip and oatmeal! 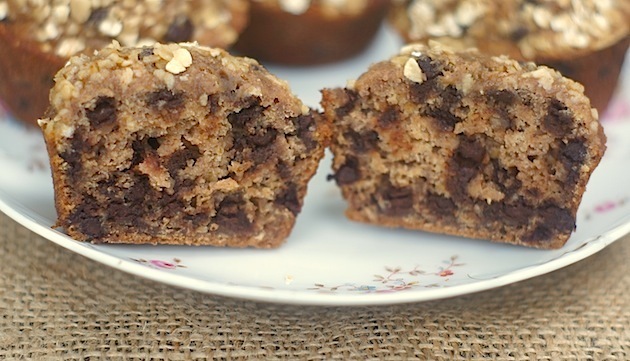 Any muffin with oats and chocolate chips is bound to be good! Cookie muffins sound good to me! They look great Amy! hmm… i think i have every ingredient already to make these! they look delish!